Ann Arbor City Hall is located at 301 East Huron Street, Ann Arbor, MI 48104; phone: 734-794-6000. Photo: Floyd R. Melchem House, ca. 1898, 1402 Hill Street, Ann Arbor, MI. Listed on the National Register of Historic Places in 1999. Photographed by User: Andrew Jameson (own work), 2010, [cc-by-3.0 (creativecommons.org/licenses/by/3.0)], via Wikimedia Commons, accessed January, 2013. Ann Arbor, on the Huron River, is the seat of Washtenaw County, the home of the University of Michigan, and the trading center of a large agricultural and fruit-growing region. 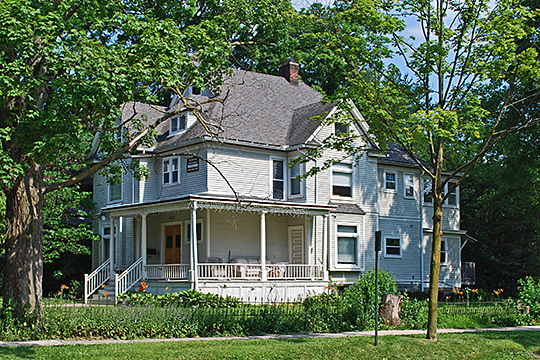 The first impression created by Ann Arbor is one of Midwestern charm. It seems to be almost entirely composed of trim, shady, residential streets, some rising steeply out of the winding river valley toward the range of rolling hills in which Ann Arbor is set. Eighty-five per cent of the families here own their homes. The city is further individualized by the many university buildings and the presence, during most of the year, of thousands of students; these temporary residents, with their strenuous program of activities, both serious and lighthearted, and their easy and sometimes gay attire, spice Ann Arbor life. A trading and commercial district, with a mixture of old buildings and modern stone and brick structures, occupies the center of the city. Touching its southeastern rim is the University of Michigan campus, which, with its surrounding buildings, fills a quarter-mile circle. Other university edifices are scattered for three-quarters of a mile to the northeast, where the high, buff-walled University Hospital towers above surrounding structures. In the southwest section are the university athletic fields and the stadium. The city's two industrial districts are scarcely noticeable to the casual observer. One parallels the railway angling through the western residential section, and the other, in the north-central area, is along the railroad that follows the Huron River. In the construction of Ann Arbor churches, public buildings, and many houses, liberal use has been made of the varicolored field stones with which the countryside abounds. Steeples and schools and corner grocery stores give the west side the air of a rural community, with glimpses of the near-by hills at the end of almost every street. On Wednesdays and Saturdays, farmers drive in to sell their products at the open-air market and load their cars with a week's supply of necessities. John and Ann Allen, from Virginia, and Elisha and Ann Rumsey, from New York, settled in the Michigan forest at Allen's Creek in 1824. According to tradition, they built an arbor and trained upon it the wild grapevines they found twining through the branches of a plum tree beside the creek. They named their settlement Anns' Arbor, in compliment to their young wives. A journal kept by James Turner Allen, and now in the Clements Library, corroborates this story. Another account, given by David Hackett, a pioneer who returned to Ann Arbor in 1900 after an absence of 70 years, insists that the name refers to Ann d'Arbeur. 'Ann, the guide,' as she was known, was a young, frail, yet fearless and untiring woman who was a wilderness guide out of Detroit as early as 1813. When the route from Detroit westward became better known, and there was less need for a guide during the first part of the journey, Ann moved to a hillside above the Huron River and accompanied convoys from that point. Her life and her reasons for following this strange and lonely occupation were largely hidden in mystery. A partial explanation was given one day to a group of settlers who came to ask her to join their colony, across the river from her cabin. Ann led them to a grave near her home and exclaimed, 'Here lies all that is most dear to Ann d'Arbeur, and here shall she stay while life lasts.' She was killed by a falling tree two years later, and her entire story was never known; but Hackett asserted that the pioneers paid tribute to her memory by giving her name to the settlement on the river. Attempting to substantiate his statements, Hackett searched in the Huron River for a rock upon which settlers are said to have inscribed 'In memory of Ann d'Arbeur'; but his search was fruitless. The Indians knew the settlement by another name. They called it Kaw-goosh-kaw-nick, from the sound of the gristmill Allen set up soon after he arrived. Other mills, a tannery, and a general store followed. The store was painted bright red and gave the spot where it stood today the intersection of Huron and Main Streets, business center of Ann Arbor-the name, Bloody Corners, a title that survived the store. Emigrants from Virginia and New York, and later from Ireland and Germany, came to the village. Ann Arbor was made the county seat in 1827, and the first court was held on January 25 of that year. Ann Arbor was just 13 years old and its population less than 2,000 when it had the temerity to bid for the University of Michigan, an institution previously located in Detroit. The bid was successful. The deal was managed by a group of canny real estate men, who foresaw a land boom following the establishment of the university and donated 40 acres to the State to help the cause. Ten years later, in 1847, Ann Arbor bid unsuccessfully for the State capital. Michigan State Administrative Board, Michigan Writers' Project, Works Projects Administration, Michigan: A Guide to the Wolverine State, American Guide Series, 1941.